You may know that the media used in magnetic recording technologies, such as computer hard drives, are made of millions of tiny nanomagnets. Each nanomagnet can be switched up or down to record bits of information as ones and zeros. These media are constantly subjected to magnetic fields in order to write, read, and erase information. If you have ever placed a magnet too close to your laptop or cell phone, you know that exposure to an external magnetic field can disrupt information stored this way. Did you know that it is possible for the nanomagnets to “remember” their previous state, if carefully manipulated under specific magnetic field and temperature conditions? 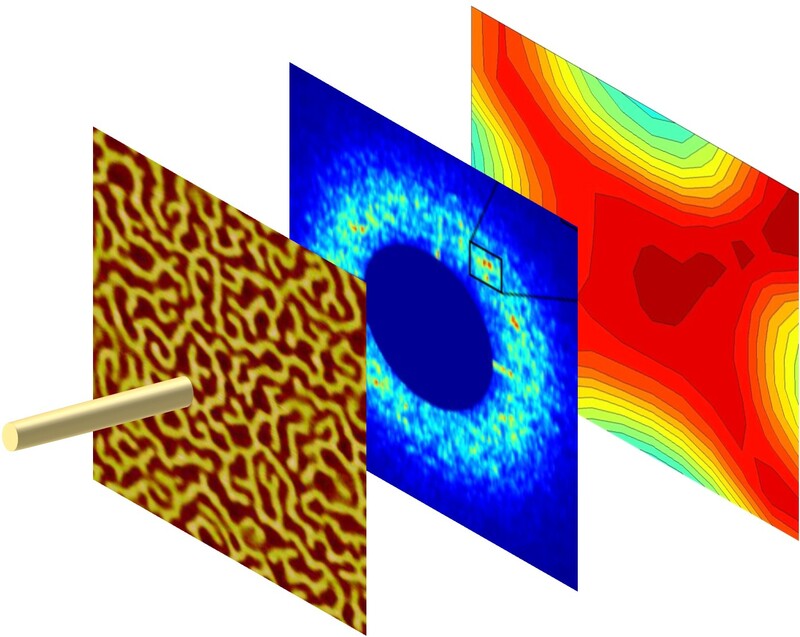 Using a kind of memory called topological magnetic memory, scientists have found out how to imprint memory into magnetic thin films by cooling the material under the right conditions. In a different kind of magnetic behavior, known as antiferromagnetic, the magnetization of adjacent atoms points in opposite directions. When cooled below a certain temperature, called the blocking temperature, antiferromagnetic materials can be “frozen” into this pattern. Thin films made of the elements iridium and manganese exhibit antiferromagnetism. It’s when ferromagnetic and antiferromagnetic films are combined that things really get interesting. 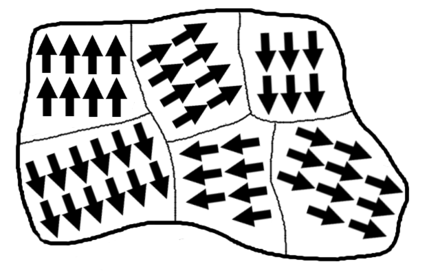 When a material is cooled below the blocking temperature, magnetic interactions called exchange couplings appear between the ferromagnetic and antiferromagnetic layers, allowing the template that was “frozen” in the underlying antiferromagnetic layer to influence the formation of magnetic domain patterns in the ferromagnetic layer. At low temperatures, the direction of magnetization in the ferromagnetic layer can still be flipped by the application of a magnetic field; when the field is removed, however, the domain pattern in the ferromagnetic layer tends to revert back to its original conformation, to match the template imprinted in the antiferromagnetic layer. By cooling the material, we can induce this kind of memory, called topological magnetic domain memory, restoring the original pattern in the ferromagnetic layer even after it has been exposed to an external magnetic field. Fig. 2 (Click to enlarge) Fig. 2 (a) Magnetic domain pattern in a ferromagnetic thin film; (b) x-ray scattering "fingerprint" of the magnetic domain pattern; (c) correlation map showing the extent of topological magnetic memory observed in this material (red = high, blue = low). Fig. 3 (Click to enlarge) Fig. 3 This figure shows a selection of correlation maps measured in different cooling conditions. 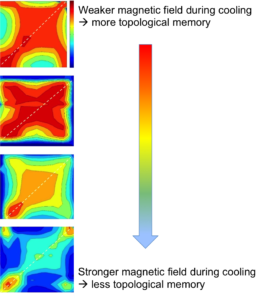 Each map shows the amount of magnetic domain memory throughout the magnetization process, with the color red being high and color blue being low. What changes from the top map to the bottom map is the strength of the magnetic field during cooling. This shows the gradual loss of magnetic memory as the magnitude of the cooling field is increased.